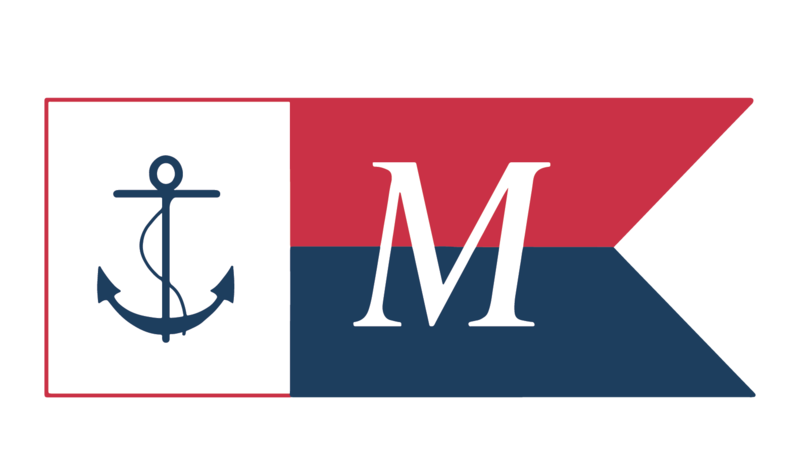 For over twenty years, Maine Maritime Museum has been entrusted with the care of a long term loan of a large collection of carved ivory. 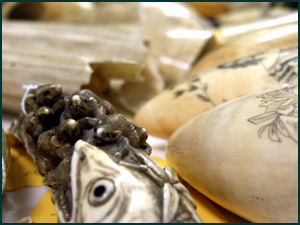 Besides some exquisite scrimshaw (incised whale teeth) and netsuke (carved toggles), this collection holds a wide range of cane handles, corkscrews, knife rests, and other familiar objects, all elaborately created in ivory. While checking the inventory of this loan, I casually picked up one of the needle-cases and held it up to the light to admire its filigree carving. With enthusiastic Victorian whimsy, it had been decoratively pierced to allow light to pass right through. In a flukey moment of happenstance, my eye was attracted to an odd glinting in one of the through-holes bored in the end. 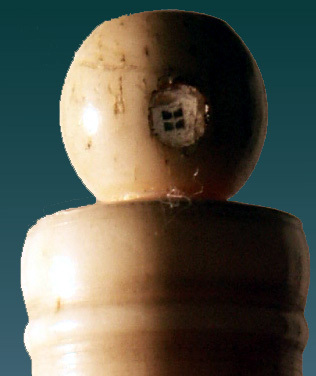 Looking closer, there appeared to be a tiny glass bead inserted inside the hole. 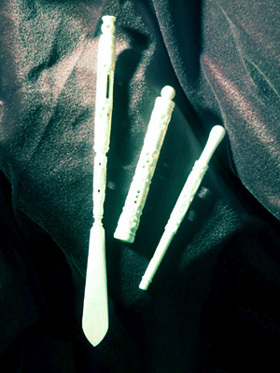 To my utter astonishment, as I rolled the ivory around in my fingers, tiny pictures appeared inside the glass bead. By moving the needlecase close to my eye, and carefully aligning the hole with some bright backlight, a perfectly focused 'slide' could be viewed. 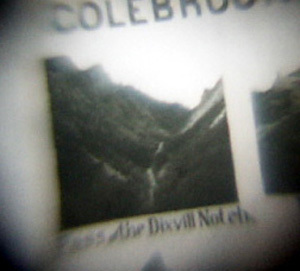 Arranged below a title, "Colebrook, N.H.", were four photographic views of individually labeled geographical features. 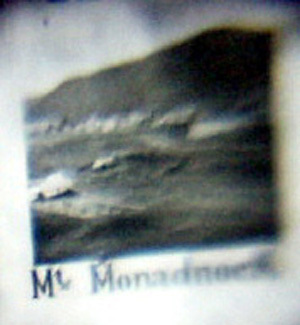 All this from a glass lense no bigger in diameter than a pencil lead. Dix House, ca. 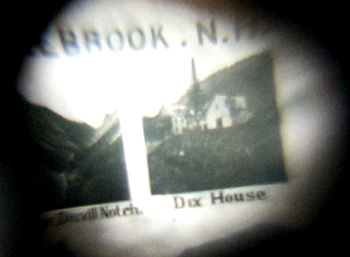 1890: A summer guest house in the Notch since 1866, the Dix House was renamed in 1895, and has prospered to this day, greatly expanded, as The Balsams. The inclusion of this view is a puzzle: Colebrook and Dixville Notch straddle the far north of New Hampshire near the Canadian border; Mt. Monadnock is far to the south near Keene and Massachusetts. 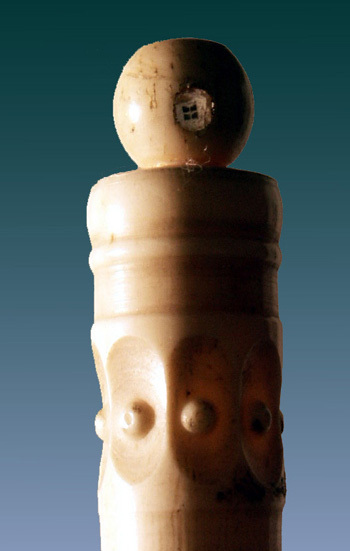 Needless to say, the surprise of this miniature hidden novelty prompted me to look over the rest of the ivory collection with an eye to more hidden glass bead lenses. 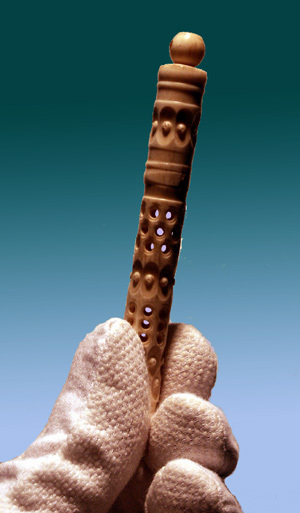 Sure enough, two more came to light: in the surviving handle of an unknown utensil was imbedded a view of four prominent churches in Milford, N.H., ca. 1880; and in the end of a letter opener nestled an image of the Chapel of St. Sepulchre, Jerusalem. 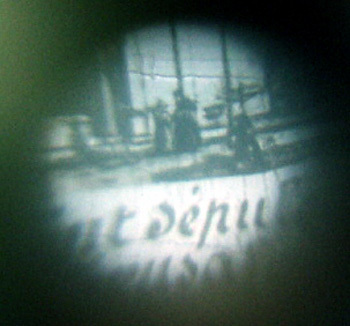 What are we to make of these tricky little peephole views? As it turns out, there is nothing new under the sun, nor on the Internet. 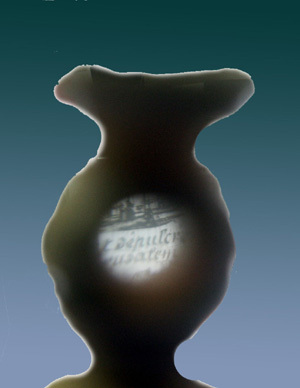 Such a miniature glass-rod microscope lense was invented by the prolific scientific experimenter Charles Stanhope, (1753-1816), the Third Earl of that name. 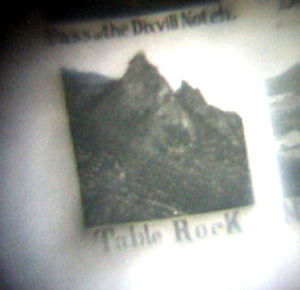 By the 1860's, micro-photography, in which the optics of enlarging were reversed to create imagery of microscopic size, had become a commercially exploitable parlor novelty. 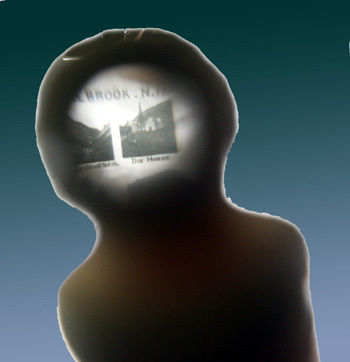 Concealed 'Stanhopes', with images ranging from the erudite to the risque were imbedded in souvenir items from rings to cigar holders to our ivory knick-knacks.